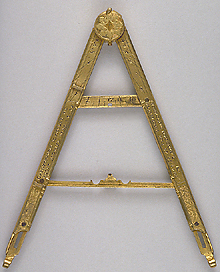 The instrument consists of a sundial engraved on a pair of dividers. The compass is fitted on the hinge, and the hour lines are engraved on the arms of the dividers and on a folding cross piece. At the end of each arm is a retractable gilt brass hook.